Current production from natural forests will not satisfy future world demand for timber and fuel wood, and new land management options are required. We explore an innovative production system that combines the production of short rotation coppice in wide alleys with the production of high-value trees on narrow strips of land; it is an alternative form of alley cropping which we propose to call ‘alley coppice’. The aim is to describe this alley coppice system and to illustrate its potential for producing two diverse products, namely high-value timber and energy wood on the same land unit. Based on a comprehensive literature review, we compare the advantages and disadvantages of the alley coppice system and contrast the features with well-known existing or past systems of biomass and wood production. We describe and discuss the basic aspects of alley coppice, its design and dynamics, the processes of competition and facilitation, issues of ecology, and areas that are open for future research. Based on existing knowledge, a solid foundation for the implementation of alley coppice on suitable land is presented, and the high potential of this system could be shown. Christopher D. Morhart: designing the experiment, writing the paper and supervising the work. Anil R. Graves: designing the experiment and writing the paper. Gerry C. Douglas: designing the experiment and writing the paper. Christian Dupraz: designing the experiment and writing the paper. Michael Nahm: designing the experiment, writing the paper and coordinating the research project. Pierluigi Paris: designing the experiment and writing the paper. Udo H. Sauter: designing the experiment and coordinating the research project. Jonathan Sheppard: writing the paper. Heinrich Spiecker: designing the experiment and writing the paper. It is predicted that by the middle of the twenty-first century, the greatest proportion of human wood consumption will come from planted forests, most of them intensively managed (Sedjo 2001). It has been shown that the natural forests of the world do not have the capacity to sustainably meet the current demand for timber and for fuel wood (Fenning and Gershenzon 2002). Additionally, in recent decades, the interest in renewable energy has grown, and thousands of hectares of short-rotation coppice (SRC) have been planted worldwide to satisfy biomass requirements (Fiala and Bacenetti 2012; Schweier and Becker 2012). At the same time, the demand for high-quality timber, such as common ash (Fraxinus excelsior L.) and sycamore (Acer pseudoplatanus L.), has outstripped supply and needs to be increased (Becker and Klädtke 2009). An innovative approach to boost capacity is to combine the production of SRC and valuable timber trees on the same land unit so as to capture all available light more efficiently. Much has been written about the management and environmental effects of SRC and agroforestry as separate land management systems. However, the combined approach of alley coppice has so far received much less attention both in theory and in practice (Unseld 2007; 2009; Clinch et al. 2009; Morhart et al. 2010; Cardinael et al. 2012). Such a combined production system has similarities with several systems which are well known in conventional forestry (mixed plantations and coppice-with-standards), in biomass forestry (SRC) and in agroforestry (alley cropping). We discuss the main features of these known systems separately, and we evaluate the characteristics which may apply in a system of alley coppice. Forest plantations respond more quickly and efficiently to management inputs in comparison to traditionally managed forest stands (West 2006). However, forest plantations can be characterised by significant biological and economic risks, especially when establishing monocultures, with uniform genetic composition at stand and/or landscape level. To mitigate these risks, the mixing of different tree species in plantation stands is a beneficial alternative to a monoculture planting design. There are numerous successful examples of mixed plantations in the tropics, for example, eucalyptus (Eucalyptus globulus Labill.) and acacia (Acacia mearnsii (Vahl) Benth.) in Australia, (Forrester et al. 2005), Brazil and Congo (Bouillet et al. 2013); Eucalyptus saligna Sm. and Albizia falcataria (L.) Fosberg in Hawaii (DeBell et al. 1997); and in temperate countries such as black alder (Alnus glutinosa (L.) Gaertn.) and hybrid poplar ‘Roxbury’ (Populus nigra L. × Populus trichocarpa Torr. and Gray) in Canada (Côté and Camiré 1987), and wild cherry (Prunus avium L.) and other broadleaves in Chile (Loewe et al. 2013). Mixed plantations offer a variety of multiple benefits, both at productive and environmental levels. There can be a significant yield increment at stand level, with overall productivity being dramatically increased in mixed designs in comparison with monocultures; this is highlighted in the case of eucalypts in mixtures with nitrogen-fixing tree species such as A. mearnsii and A. falcataria (DeBell et al. 1997; Forrester et al. 2005). However, contrasting negative results might also be obtained, such as in the case of eucalyptus (Eucalyptus robusta Sm.) with Casuarina equisetifolia L. or with Leucaena leucocephala (Lam.) de Wit (Parrotta 1999). Another important productive advantage of mixed plantations is improved rates of individual tree growth and stem quality. These advantages are extremely important when producing high-quality timber. Many broadleaves have poor apical dominance, and mixed plantations can significantly improve stem straightness due to canopy stratification, which results in modulated light competition, suppressing epicormic branches and enhancing branching habit (Mohni et al. 2009; Loewe et al. 2013). These positive interactions on stem form are crucial, especially for timber species for which genetically improved material is not yet available, due to their long breeding cycles or to difficulties in vegetative propagation. The risk of pest damage (fungi, bacteria and insects) can have significant productive and environmental consequences which affect the financial success of forest plantations. Mixing different species in plantation stands reduces pest risk by enhancing genetic diversity at stand level. However, this aspect of mixed stands is particularly difficult to study, because pest damage can happen episodically and be affected by the vegetation structure at landscape level. Loewe et al. (2013) have reported contrasting results for the same mixed plantation design in different locations of the same region. Two mechanisms are involved in reducing pest risk in mixed stands: the dilution of the host concentration for a pest organism and habitat diversification which allows greater populations of natural enemies of pests to be supported (Watt 1992). Therefore, the habitat diversification provided by mixed species plantations creates important environmental services for biodiversity conservation, and is especially important for the restoration of degraded lands. Mixed plantations, with simultaneous planting of pioneer to climax tree species, have proven to be a sustainable approach to restoring natural vegetation. This has been shown both on spoiled mining soils in Brazil (Parrotta and Knowels 1999) and Germany (Lögters and Dworschak 2004), and on abandoned agricultural lands in Sri Lanka (Ashton et al. 2001) where mixed plantations have been superior to alternative approaches using sequential introduction of species of different characteristics or stages of succession. In addition to biodiversity, carbon sequestration is another key environmental service of mixed species plantations. Trees are efficient sequesters of carbon, with carbon storage capacity increasing according to stand age and ecosystem total biomass (Magnani et al. 2007). The composition of tree species is also another important factor in carbon sequestration. Research evidence showed that mixed species plantations have the potential to store more carbon than monocultures in fewer years. Examples of this include 11-year-old E. globulus/A. mearnsii mixtures in Australia (Forrester et al. 2006) and 12- to 13-year-old mixtures of nine native indigenous tree species in Costa Rica (Redondo-Brenes and Montagnini 2006). The greater carbon storage capacity of mixed plantations in comparison to monoculture plantations is dependent on greater carbon sequestration in the vegetation and soil, for example, with Chinese fir (Cunninghamia lanceolata (Lamb.) Hook.) and alder (Alnus cremastogyne Burk.) (Wang et al. 2009), in the leaf litter just above ground level (eucalyptus with acacia, Forrester et al. 2006), and just below ground level (Castanopsis hystrix A. Dc. with Pinus massoniana Lamb. in China (He et al. 2013)). According to Redondo-Brenes and Montagnini (2006), long-term carbon storage capacity seems to be dependent on the successful interaction between fast-growing tree species and slower growing species, such as high-quality timber trees in the mixtures. This poses questions regarding the trade-off between carbon sequestration and excessive water consumption for forest plantations (Vanclay 2009), with faster growing trees requiring more water for growth (Spring et al. 2005). Forrester et al. (2010) demonstrated higher water consumption in eucalyptus and acacia mixtures, but also an improved water use efficiency of the eucalyptus trees in the same mixture. Lauteri et al. (2006) showed evidence of functional roots stratification in water use in mixed walnut (Juglans regia L.) alder (Alnus cordata (Loisel.) Duby) plantations in temperate Italy. More research on overall water consumption in mixed stands is advocated by Vanclay (2009), specifically regarding the effects of heterogeneous canopy structures in mixed stands that might decrease the total canopy stand transpiration. Research has shown that mixed plantations, if well designed and planned, can provide multiple productive, financial and environmental benefits (Evans 1984; Hemery 2001). So far, these have been underestimated, especially by foresters who may be more interested in productivity and in simplifying management operations in plantations. This approach also tends to focus on a few species that are well suited to monoculture plantation schemes and to genetic improvement (Kelty 2006). 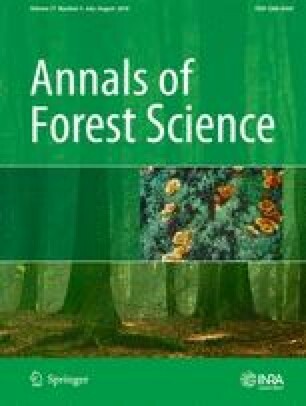 Current concerns regarding climate change and biodiversity conservation have led to suggestions that the harvesting pressure on forest stands could be decreased by implementing plantation forestry and agroforestry on agricultural and marginal lands using a wide range of native timber tree species more adapted to very specific local site conditions (Hall et al. 2011). For this innovative approach, mixed plantations would seem to be most suitable because they can combine efficient use of site resources with the benefit of multiple products in varying rotations (Redondo-Brenes and Montagnini 2006). Future research should be extended to designing operational scale plantation trials for testing innovative mixtures with an emphasis on simplicity of management regarding mechanisation and cultural operations, and a clear focus on marketability of the final and intermediate products (Magagnotti et al. 2010). Coppice with standards has been alternatively named as stored coppice, composite forest or compound coppice. Coppice with standards consists of two major structural elements. The majority of trees form an even-aged understory and follow a traditional coppice culture management, in combination with selected trees constituting the larger uneven-aged trees as ‘standards’ representing the over-storey. In Germany, the first documented appearance of the coppice with standards system can be dated to 600 ad, in France to the Middle Ages, and records from the twelfth century exist in England (Troup 1928). Similarly in eastern European countries, the system was well known and important for landowners. Coppice with standards has enjoyed a long tradition and reached a peak around the year 1900 covering 3 % of the total land area in the present day Czech Republic and Slovakia (Machar 2009). In some parts of England, coppice with standards was considered to be the most important form of woodland management from an economic point of view up until the middle of the nineteenth century (Rotherham and Jones 2000), and in Germany, coppice with standards was the most important broadleaf forest in the seventeenth and eighteenth centuries (Gross and Konold 2010). A coppice system provides small wood for fuel and other uses within short rotations periods (10–30 years), depending on the site and tree species (Hamm 1900). For the regeneration of coppice with standards, the methods utilised were vegetative reproduction and regeneration from seed, with the planting of trees being least common. The harvest of the coppice was carried out by clear-cutting all trees with the exception of selected trees left as future standards. Standards were managed to produce large-diameter timber over long rotations but also to provide seeds for natural regeneration or even to help to protect the coppice understory against frost (Troup 1928). An additional function, important in the past, was the non-timber value, i.e. the production of fodder for animals, especially pigs and sometimes game (Burschel and Huss 1997). The number of standards in ancient forests was heavily dependent on the desired production goal; a general rule of 30–100 standards per hectare between all classes has previously been proposed (Evans 1984). Nevertheless, it was recognised that the quantity of standard trees must be dictated by the coppice layer’s light requirement (Hartig 1820). One advantage of the system was the rapid growth of the standards and their above-average growth in volume and value (Nyland 2002). Standards could be selected from coppice stock, but they were selected preferably from trees of seedling origin (Troup 1928). Compared with trees grown in close-canopied high forests, the standards had shorter boles and a higher proportion of branch wood (Troup 1928). The architecture of trees is dependent on the length of the rotation and silvicultural practices, and it can be modified by the application of artificial pruning employed at the correct developmental phase. In this ancient silvicultural system, the presence of standards created a more diverse array of species and age classes, and provided improved habitat structures over those provided by pure coppice systems. Furthermore, the outward appearance of the coppice area which was regularly cut was softened by the presence of standard trees both pre- and immediately post-harvest. The rotation age of coppice was dependent on the tree species that were selected as standards and the shade tolerance of the coppice crop. The standard rotation was always a multiple of the coppice rotation (Hamm 1900; Troup 1928). The general characteristics of a coppice with standards system is that all species used should be able to resprout from a cut stool while displaying fast growth. Species that demanded high-light conditions are less suitable for the coppice layer, while the ideal standards should display a degree of self pruning and have naturally thin and high crowns, such features provided better growing conditions for the coppice (Troup 1928). The typical species used within this system included: oak (Quercus spp. ), ash, sycamore, wild cherry, poplar (Populus spp. ), beech (Fagus sylvatica L.), hazel (Corylus avellana L.), alder (A. glutinosa), hornbeam (Carpinus betulus L.), birch (Betula spp. ), lime (Tilia spp. ), walnut (Juglans spp.) and sometimes conifers (Troup 1928; Burschel and Huss 1997). Often, combinations of the above species were chosen. In the past, oaks were important for boat and building construction, but they also provided acorns as fodder for pigs. For this reason, oak was a common tree utilised for standards in Europe (Troup 1928), and remnants can be frequently seen today. In modern times, the decreasing demand for fuel wood caused by a growth in coal use has reduced the interest in coppice systems. Over time, most of the coppice with standards systems has been converted into high forests, often accompanied by the planting of fast-growing conifer species, with a focus on production of large-diameter timber trees. The remainder was left unmanaged and grew into broadleaf-dominated forests. This is especially true in England where large areas of former oak and hazel coppice (Moss et al. 1910) were abandoned following the First and Second World Wars (Hopkins and Kirby 2007). There are, however, exceptions to the decreasing area coverage of coppice with standards. In France, such coppice systems still cover 37 % of the forest area (Vallet et al. 2006). In addition, coppice with standards remains a commonly utilised system in many Mediterranean areas, using a range of oak species (Messier et al. 2013) and, therefore, still constitutes an important silvicultural system. Systems similar to coppice with standards are rarer in the tropics than in Europe. However, renewed interest in coppice with standards has resulted in testing of eucalyptus in Rwanda (Reynders 1984), teak (Tectona grandis L.F.) in Ghana (Adu-Anning and Blay Jnr. 2001) and in India (Singh and Singh 2011), as well as sal (Shorea robusta C.F. Gaertn.) in the Himalayan regions of India (Negi 2000). The coppice with standards system is not necessarily restricted to broadleaf species. In Korea, a system utilising pitch pine (Pinus rigida Mill.) standards with a black locust (Robinia pseudoacacia L.) coppice understory has been reported (Stewart 1980). At present, coppice with standards systems are seldom found as commercial ventures in Europe, but they can be considered to be interesting alternatives to other currently employed silvicultural systems (Suchant et al. 1996). Furthermore, due to their species diversity and the canopy structure created through their unique management, they also provide high ecological and protective values (Suchant et al. 1996; Machar 2009; Messier et al. 2013). Alley cropping is an agroforestry practice that involves the planting of row crops or pasture in alleys formed by single or multiple rows of trees or shrubs (Garret and Buck 1997; Gillespie et al. 2000). The rows of trees provide various benefits, such as high-quality timber if the trees are allowed to mature (often called silvoarable systems (Dupraz 1994), crop fertilisation through use of leguminous trees (Kang et al. 1981) or biomass for energy (Tsonkova et al. 2012), if the trees are coppiced. Alley cropping is a modern form of agroforestry that can be designed to be compatible with crop mechanisation. It is typically a two-storey agroforestry system, where light competition between the trees and crops plays a major role in the productivity of the method (Talbot and Dupraz 2012). Alley cropping was initially developed in Nigeria during the 1970s at the International Institute for Tropical Agriculture (Kang 1997), primarily as a soil fertility-enhancing technique (Graves et al. 2004). Rows of trees or shrubs were pruned prior to crop planting and then pruned again periodically during crop growth to prevent shading. The pruned biomass was then used as a green manure or mulch in the intercrop area (Graves et al. 2004). It was initially envisaged that fast-growing nitrogen-fixing trees or shrubs would create soil conditions similar to those produced during the fallow phase of shifting cultivation systems, because they could cycle nutrients, suppress weeds and reduce erosion. Early experimental results, obtained in humid climates and fertile soils, were promising, with significant intercrop yield increases (Atta-Krah and Sumberg 1988). But the results in semi-arid regions were less favourable and where environmental resources were scarce; long-term benefits to fertility appeared to be offset by short-term competition for water and nutrients (Rao et al. 1998). Although uptake of alley cropping in humid parts of Africa was initially high, many farmers subsequently abandoned it. Douthwaite et al. (2002) reported that in Nigeria, no new adoption was seen to occur after the 1990s; the high labour requirements for establishing and managing the woody component, and incorporating its biomass in the intercrop soil, were viewed as major constraints. Further studies have reported similar findings, with farmers stating that the labour needed for pruning was an especially problematic aspect of alley cropping (David 1995; Craswell et al. 1997). However, farmers have adapted alley-cropping practices when they are able to modify them to meet specific requirements. In the Philippines, Garcia et al. (2002) reported that farmers increased alley widths, used single rather than double hedgerows, reduced pruning and mulch application, and used various tree species in the hedgerows in order to satisfy a range of other needs. Whilst these modifications reduced the value of alley cropping as a soil fertility-enhancing technique, they did allow alley cropping to be operationalised within the constraints of the farmer, so that the system could be used to satisfy a wider range of livelihood needs (Graves et al. 2004). In the temperate zone, where fertilisers are easily available and soil fertility is less of a concern, alley cropping frequently takes the form of combinations of high-value trees cultivated in rows and separated by wide alleys that are cropped with annual or perennial plant species. Such silvoarable systems have recently been the subject of major research efforts in Europe aimed at developing computer simulation tools (Van der Werf et al. 2007; Graves et al. 2010a; Keesman et al. 2011), to identify and quantify their major economic (Graves et al. 2007, 2010b) and environmental benefits (Palma et al. 2007a, 2007b) as well as to determine how farmers might respond to such innovations (Graves et al. 2008). The wide spacing between the rows of trees in silvoarable systems increases rates of growth and can, with an appropriate pruning regime, increase the value of the timber through an enhanced form and increased bole length. In the southern USA, cotton, peanut, maize, soybean, wheat and oats are important crops for alley cropping, and these are normally combined with trees such as pines (Pinus spp.) and pecan (Carya illinoensis K. Koch) (Wanvestraut et al. 2004; Zamora et al. 2007). The increasing demand for timber of high quality in Europe, and the decline in tropical hardwood availability, has stimulated the development of silvoarable systems specifically intended for high-quality timber production (Dufour et al. 2013). In contrast to fruit trees, it is considered that there is no critical stage at which the growth of timber trees in alley cropping systems can be impaired by competition from crops (Dupraz 1994). In Italy, silvoarable systems of hybrid poplars and cereal crops were developed in the Po Valley in northern Italy and subsequently adopted throughout northern Europe by the 1980s. The system incorporated maize, soybean and cereals between the tree rows during the first 2 years of a tree rotation lasting between 7 and 10 years, but declined because European Union grant systems for planting trees on arable land did not permit intercropping (Eichorn et al. 2006). In France, the system became widespread in the eighteenth century and is still used on approximately 6,000 ha of alluvial soils throughout the country. In the UK, large hybrid poplar plantations in southern England were developed for the production of matches in the 1950s (Beaton 1987; Dupraz and Newman 1997). The alleys were intercropped with cereals for 8 years, then under-sown with a grass and clover mixture, and grazing until year 20; after which, light interception by the tree canopy prevented sufficient pasture development. The poplars were then harvested when about 25 years old. Results concerning the land equivalent ratio (LER) (Mead and Willey 1980) of modern alley cropping systems have raised interest in the system. Dupraz and Liagre (2008) recently published results of the first-ever alley cropping experiment to be monitored from tree establishment through to final tree harvest. A LER of 1.4 was found for this poplar-wheat system. This ratio means that a 100-ha farm using an alley cropping system of walnut trees and cereals could produce as much cereal and walnut timber as a 140-ha farm where the trees and cereals are cropped separately. Therefore, alley cropping with timber trees is considered to be more ecologically efficient relative to monoculture production of the same components. Explanations for this relatively high productivity include more efficient capture of light due to lagged phenology of trees and crops (Graves et al. 2010b; Talbot and Dupraz 2012) and the plasticity of tree root systems that are displaced by crop root competition to deeper horizons, thus reducing competition for water and nutrients (Mulia and Dupraz 2006). Some guidelines for the design of sustainable alley cropping systems have been produced through the use of computer simulation models (Talbot 2011). For example, it is recommended that tree rows should be spaced at twice the height of the mature trees, so that the yield of the alley crops will not decrease significantly during the first half of the tree life cycle, and so that they will remain high enough to provide economic profit until the trees are harvested. The effect of trees in alley cropping systems is also of interest environmentally (Palma et al. 2007c). Trees are capable of capturing and recycling fertiliser nutrients from deeper soil horizons than crops, and this helps to improve nutrient use efficiency as well as mitigate groundwater contamination by excess nutrients (Rowe et al. 1999; Allen et al. 2004). Intensive agricultural production has caused groundwater and surface water contamination through nitrogen leaching and is a major environmental problem. Agroforestry systems, and alley cropping in particular, have been identified as a means by which the nitrogen contamination of water can be reduced (Jose et al. 2004; Palma et al. 2007c). Other environmental benefits also exist. The tree rows provide habitat for several fauna and flora species, and help protect and enhance biodiversity in arable landscapes (Palma et al. 2007c). Evidence suggests that the biological control of several crop pests could potentially be achieved using silvoarable systems, but knowledge on how this can be reliably managed is lacking, and more research is needed (Smits et al. 2012). Biomass production in short rotations of 3–5 years involves growing species which can freely coppice, produce high yields of biomass on agricultural land and be mechanically harvested. The aspects of SRC forestry which are applicable to the proposed alley coppice system are described below in “Short rotation coppice production in alley coppice.” The general features of SRC are well known and reviewed (Verwijst and Nordh 1992, Brown et al. 1996, Verwijst and Telenius 1999, McCracken et al. 2001, Aylott et al. 2008, Wickham et al. 2010, Filat et al. 2010, Paris et al. 2011; Fiala and Bacenetti 2012; Morhart et al. 2013b). The combination of growing SRC together with high-value timber trees is an alley cropping system with SRC as the intercrop, and is therefore close to the coppice with standards system. In alley coppice, the timber trees are aligned while they are randomly distributed in most coppice with standards. Furthermore, alley coppice systems are intensively managed and better suited to agricultural land rather than forest land. The alley coppice system consists of narrow strips of land for production of high-value timber trees in rows at wide spacing combined with wide alleys between the rows of trees for production of SRC (Fig. 1). The main features of an alley coppice system and the ancient coppice with standards are compared and summarised in Table 1. A major difference between the two systems, as noted in Table 1, is the shorter rotation with alley coppice and the optimised design, to combine the mechanised production of coppice biomass and high-value timber trees. The coppice with standards system was historically practised on less fertile forest sites, while current alley coppice systems may fit to more fertile sites formerly used for agriculture; this facilitates shorter harvesting cycles and production of timber trees of high value for industrial transformation such as veneering, according to past investigation conducted in Italy on common walnut and wild cherry (see Zanuttini et al. 2006). However, more research is needed concerning the relationship between wood quality and growth rates of temperate valuable hardwoods. Cherry (Prunus spp. ), ash (Fraxinus spp. ), maple (Acer spp. ), walnut (Juglans spp. ), Sorbus spp. The goal of high-value timber production is a straight and branch-free bole of sufficient quality for use as veneer wood. The crop tree species proposed for this purpose should be capable of producing a high-value product and include wild cherry, common ash, sycamore, sweet chestnut (Castanea sativa Mill. ), walnut (including Juglans nigra L. and hybrids), alder (Alnus spp.) and Sorbus spp. To be able to produce valuable timber trees in combination with SRC, it is essential that the trees be given appropriate space for crown development. The required spacing for a given final target diameter of the tree stem can be calculated from the crown projection area, based on the close correlation that exists between stem diameter at breast height and crown width. This can serve as the basis for calculating an appropriate spacing for trees within the tree rows and the width of the coppice alleys which are between the rows of crop trees. Hein and Spiecker (2009) suggest a simple species-based thinning rule utilising a constant value based on the arithmetic mean of trees with a diameter at breast height of 30 and 60 cm, assuming crown cover of 70 % for ash and sycamore, and 50 % for wild cherry. The mean distance between crop trees or standards is dependent on the mean radial increment. It should be set at between 20 and 28 times the target diameter at breast height (ash, sycamore and wild cherry). For example, for a target diameter of 50 cm at breast height for wild cherry, this rule dictates a final distance of 12.5 m between trees. Dupraz and Liagre (2008) agree that trees should not be planted too closely on the tree line and recommend distances between 4 and 10 m depending on the expected tree canopy size of mature trees. Using an optimal spacing as described above, high annual diameter increments of 1 cm per year can be achieved (Spiecker 2006). Adequate spacing of trees ensures that tree canopies do not close or shade each other out until the point of harvest; this minimises dead branches and the potential for fungal infection (Oosterbaan et al. 2009). To ensure a high success rate of the timber trees, we advocate the planting of trees in groups of two or three at a 2-m spacing within the rows so that poor trees can be removed and only the best trees can be chosen as future crop trees. Nevertheless, the initial tree density is comparable with other agroforestry systems and should be as low as possible consistent with a final harvest of 50 to 80 mature trees per hectare (Balandier and Dupraz 1998). It is also desirable to plant the timber trees in advance or at the same time as establishing the coppice crop. This should facilitate an early establishment of the timber trees with minimal early competition. The fast-growing SRC may dominate the high-value timber trees initially, so we suggest a managed crop-free strip of 3 m on both sides of the high-value timber trees. The production of high-quality timber is the ultimate goal for the timber tree strips, so pruning is of absolute necessity and should be performed until the required branch-free bole length has been reached (Balandier 1997; Balandier and Dupraz 1998). This part of the tree accounts for 90 % of the total tree value (Dupraz and Liagre 2008), and the application of a pruning treatment has been observed to more than double the value of the final timber crop (Pryor 1988). The aim is to produce logs for the veneer industry that are a multiple of the required veneer length of 2.5 m. The target branch-free bole length should be between 5 and 10 m, but this will be dependent on site quality. The distance between the strips stocked with valuable timber trees should be wide enough so as not to reduce the growth of the SRC component. It has been shown that a spacing between the tree rows equal to twice the final height of the timber trees allows crop yields to remain profitable until final tree harvest (Talbot 2011). If the height of the timber trees exceeds the width of the alley, it is very possible that most crops will no longer be profitable. However, it should be noted that these results, obtained for winter annual crops, should not be extrapolated to SRC. It is likely that SRC production will in fact be more adversely affected by light competition from the trees than most winter cereals, since these have a significant portion of their growth cycle when the trees are leafless. Nevertheless, Clinch et al. (2009) showed that some shading from bigger trees can also be beneficial to the growth of SRC, probably because it lowers evapotranspiration, thus increasing soil moisture content. The proposed alley coppice system is flexible and can be designed to suit the land manager’s needs. If SRC is the primary production goal, the tree rows can be widely spaced to maximise the SRC cropping area. The ideal orientation of the tree rows is north–south to allow maximum sun penetration to the coppice crop and minimal shading by trees. However, specific site characteristics, such as slope, contours and field layout, that could change the optimal row orientation should be accounted for in the planning stages of the alley coppice system. The cropping area must be designed to allow for mechanical harvesters, and the system should incorporate a tree strip with a minimal width of 3 m to accommodate the high-value timber trees. The coppice species of choice depends on geographic location and soil parameters. Poplar cultivars are mostly used in south and central Europe (e.g. Italy, Spain and Germany), whereas willow (Salix spp.) is more adapted to northern latitudes (e.g. Sweden, UK, Ireland and northern Poland). Other tree species suitable for SRC include Eucalyptus spp. and R. pseudoacacia, which are currently used less frequently, but seen in countries such as Portugal (Reede et al. 2003) and Hungary (Rédei 1998). Miscanthus may also be an option. Planting density of coppice is generally higher than 5,000 stems per hectare, and management operations are fully mechanised from establishment to harvest. Management operations include herbicide treatments during the establishment phase, fertiliser application between the SRC cycles, irrigation in southern latitudes and occasional pesticides application when necessary. On soils with low nutrient content, fertilisation can be critical as the frequent harvest of large quantities of biomass deplete the soil of nutrients (Lars 2002; Guidi et al. 2008a; Morhart et al. 2013a). Where necessary, fertiliser should be applied at least once during each rotation, usually in the spring following each harvest of the SRC crop. Fertiliser can take the form of organic sewage sludge, chemical input or material for phytoremediation purposes. Moreover, the availability of soil water plays a decisive role in determining SRC yield (e.g. Murach et al. 2008). Hence, irrigation is essential for stabilising yields in areas of southern Europe prone to unreliable precipitation (Guidi et al. 2008b; Pistocchi et al. 2009). Drip irrigation is generally recommended for alley cropping and for SRC intercrop systems in southern European and is considered to be a less expensive and more efficient form of irrigation (Ayars et al. 1999; Wie et al. 2008). The alley areas being used for SRC can be designed in the same way as for the pure SRC plantations as described above. Harvesting cycles for the SRC component are generally 2–3 years, but can be more. Direct chipping in the field is the prevalent form of harvest. Wood chips, often with a high moisture content (50 % and more) must undergo artificial drying since direct combustion of fresh biomass is not desirable. Alternatively, harvested stems can be left in situ for field drying, with subsequent collection, transportation and chipping of the dry biomass. This harvesting system requires lighter and smaller machines. The number of SRC rotations with profitable yields is generally limited to 4–6 rotations (Geyer 2006; Al Afas et al. 2008), and restoring land from SRC to agricultural land use can be accomplished by stump removal. An overview of the main advantages and disadvantages of the alley coppice system in comparison with traditional SRC can be found in Table 2. To provide an example scenario, wild cherry was chosen as a common species producing a high-value timber product, in combination with poplar which is frequently employed within SRC plantations in central and southern Europe. In this scenario, four important development stages of an alley coppice plantation have been characterised. Figure 2 illustrates wild cherry grown for timber production in strips and poplar clones in wide alleys for SRC biomass production. Each stage is shown using a proportional scale, with wild cherries assumed to be 2 m high at planting, and poplar SRC cuttings assumed to be 20 cm high at planting. The main objective for the high-value wood production is a branch-free bole length of 10 m and a target diameter of 60 cm. The growth rates and development of diameter, height and crown expansion for the valuable timber trees and SRC have been deduced from the literature (Röös 1993; Spiecker 1994; Ali 2007; Hein and Spiecker 2009). At the end of the first year, the poplar SRC and wild cherry trees have grown without competing for light. The branches of the poplar SRC are still small. Weed control is essential around the trees to assist establishment during the first years. After the third year, the SRC poplar alley coppice has reached a height of about 6 m and is harvested. Cutting the SRC at this stage gives the wild cherries growing space. The wild cherry will have reached a height of approximately 3 m, so the poplar will not compete substantially for light if coppiced every 3 years. The first phase of tree pruning is carried out. The sudden exposure of tree stems to full sunlight might also stimulate the growth of epicormic shoots or even cause stem damage such as sunburn. Epicormic shoot production may be mitigated by using targeted pruning systems such as selective pruning (i.e. the preferential removal of large diameter and steeply angled branches (Springmann et al. 2011)). Sunburn damage may be mitigated by applying white latex paint to stems. In comparison with whorl-wise pruning, selective pruning can significantly reduce the survival rate of epicormics and may help shade the stem (Springmann et al. 2011). If the initial wild cherry trees are planted in groups within the rows, it will be necessary to thin them between years 5 and 15 to leave those trees with the best stem forms. After 20 years and regular branch pruning, a branch-free bole of up to 10 m in height will be produced. After 20 years, the wild cherry trees should be allowed to develop their crowns unrestricted (i.e. without further pruning). Interventions are only necessary if forks or steeply angled branches occur. Taking into account that the commercial duration of the SRC component is approximately 15–20 years, depending on the site specific conditions and the harvesting cycle, new coppice planting is necessary after this time. This can be used to modify the spacing of SRC material as well as the variety or species of SRC, therefore allowing for greater flexibility of the system and its possible adaptation to climate change, economic changes and other future changes. The intercrop may even be changed to an annual cropping system, akin to more conventional agroforestry practice. The final objective of high-value timber production has been achieved. The target diameter of 60 cm has been reached, and the valuable timber trees can be harvested. The third generation SRC component will also be harvested and can be removed at this point after reaching its optimal commercial rotation. Depending on the growth rate of individual trees, this goal could be achieved within about 60 years, with harvesting occurring over several years. It should be noted that many modification of the species used and the temporal and spatial aspects of the alley coppice system are possible, thus providing many different system variants. Alternatives also exist to the establishment of the alley coppice system. For example, this could include the introduction of a SRC component into an already-established alley cropping system that includes mature or semi-mature timber trees. Alternatively, it could include the planting of valuable timber trees within a pre-existing SRC plantation, through the removal of an appropriate number of SRC rows. The inter-species relationships in plant mixtures vary in time and space, and the ability to evaluate all aspects in the alley coppice system requires modelling solutions. However, the modelling tools currently used in agronomy and forestry are not adapted to simulating multi-species systems, and whilst some agroforestry models are available (Van Noordwijk and Lusiana 1999; Van der Werf et al. 2007; Graves et al. 2010b), validated computer-based models of alley coppice systems are not widely distributed for temperate conditions. Complementary use of light is a feature of resource use during the first years of an alley coppice system. Timber tree plantations make little use all of the available light resource during the initial years, since they are planted at a wide spacing, and the light captured by the herbaceous vegetation between the trees does not bring any significant economic return. Utilising this unused light resource for an economically productive intercrop is one of the advantages of agroforestry systems. As the rotation progresses, the timber trees will start to compete for light and dominate the SRC component, depending on the width chosen for the coppice alleys. Whilst this might often be detrimental to SRC growth, in some situations, the shade may have some beneficial effects in drought prone areas. It is, therefore, difficult to make general predictions about the balance between the positive and negative effects of light competition. The outcomes are likely to be site-specific and require new research investigations. Below-ground competition may be fierce between SRC and timber trees. Plants compete for a broad range of soil resources including water and at least 20 mineral nutrients. Although SRC and timber trees have very similar requirements, they may be able to exploit different layers of the soil with their root systems, as shown for other agroforestry systems (Van Noordwijk et al. 1996). Mixtures of leguminous and non-leguminous tree species could be desirable, since using an N-fixing SRC species such as alder or black locust could stimulate the growth of the timber trees by making more nitrogen available in the tree root zone. However, nutrient removal through the frequent harvest of SRC biomass with relatively high nutrient concentration (Lars 2002; Guidi et al. 2008a; Morhart et al. 2013a) may induce nutrient deficiencies in the timber trees, and furthermore, the nutrient demand of SRC will progressively increase and rise to a maximum level the year before SRC harvest. Relatively few computer models have been developed for mixtures of tree species (Bartelink 2000). Dynamic simulation models need to integrate competition for different resources in time and space, so as to predict the impact of highly non-linear responses to compete for specific environmental resources. Talbot and Dupraz (2012) have shown how a dynamic model of plant interaction can be used to identify key processes responsible for the productivity of an agroforestry system. The results for a walnut-wheat system underlined the importance of several processes, such as root plasticity and turn-over, and shade for critical phases of crop growth, that had not been identified as significant in earlier research. The same approach with SRC as an alley crop may help identify appropriate management options to increase the efficiency of the alley coppice mixture. Agriculture has a diverse and complex relationship with society, pivoting around its use of natural resources and the provision of ecosystem services. Ecosystem services provide a variety of benefits that have value for society and provide a well-being for humans. Examples of ecosystem services include provisioning services (for example, production of food, wood and water), regulating services (for example, climate and air quality regulation) and cultural services (for example, provision of aesthetic value and recreation). These are underpinned by supporting services for the ecosystem, such as pollination, nutrient and water cycling, and soil formation (Millennium Ecosystems Assessment 2005; European Academies Science Advisory Council 2009). Whilst agricultural landscapes can produce a range of ecosystems services for the well-being of society, intensively managed monoculture landscapes are generally considered to be depleted ecosystems (Benton et al. 2003), specialised in provisioning services, but providing relatively few of the other ecosystem services from which people benefit. An increasing amount of research has been devoted to the valuing of ecosystem services using both monetary and non-monetary approaches. However, these assessments are challenging and are hindered by lack of rigorous understanding of the mechanisms that underlie the provision of ecosystem services and understanding of social preferences for those services. A key component determining the quality and the quantity of ecosystem services is considered to be the biodiversity present within a given ecosystem. Among the key beneficial effects of both SRC and agroforestry on intensively managed agricultural land is an increase of biodiversity (e.g. Fry and Slater 2009; Quinkenstein et al. 2009; Reeg et al. 2009; Schulz et al. 2009; Mosquera-Losada et al. 2011; Baum et al. 2012; Kaonga 2012). Therefore, it is likely that alley coppice systems will also provide increased biodiversity. Furthermore, it is likely that alley coppice plots will also constitute key elements of the ‘green network’ which will connect natural features of the landscape in intensive agricultural land, in order to facilitate the movement of animals (Rigueiro-Rodríguez et al. 2009). For these reasons, it is envisaged that the alley coppice approach will help to improve the quality and quantity of ecosystem services provided from agricultural land. Some of the ways in which this might be undertaken are described in Table 3. Additional methods to improve biodiversity within an alley coppice system could include the planting of shrubs and wild flowers in the tree strips, the use of a variety of different tree species of high-value timber trees, the use of trees of different tree ages on the same tree strip and the use of different clones and ages of the SRC component. It is generally agreed that climate change will affect the functioning of both natural and cultivated ecosystems (Parmesan and Yohe 2003; Tubiello et al. 2007), and this is best mitigated by a policy of species diversification. Diversity within natural ecosystems is thought to contribute to a greater resilience to changing environmental conditions (Elmqvist et al. 2003; Allan et al. 2011). Cultivated ecosystems are mostly monocultures, and therefore considered to be more vulnerable to a changing environment (Malézieux et al. 2009); it could therefore be deduced that the increase in plant diversity in alley coppice systems will result in improving their adaptive capacity to climate change. However, there is a degree of uncertainty associated with this position, and given the importance of the topic, the following section examines how alley coppice system might respond to climate change in more detail (Lin 2011; Smith et al. 2013). The abiotic risks induced by climate change and their effects on monoculture crop yields have recently been observed (Lin et al. 2008) and may partly explain why crop yields are currently stagnating in Europe (Brisson et al. 2010). Recent research has shown that agroforestry systems may be more resilient than monoculture systems to abiotic disturbances caused by climate change (Talbot et al. 2009). The positive effects of mixed species systems could result from complex interactions between the components of the system providing a greater capacity for plant adaptation to environmental stress, including the greater root plasticity developed by plants when inter-species competition occurs, greater resource use efficiency and modifications to the micro-climate that could help to reduce plant stress. The forest-like micro-climate created by the SRC component of the alley coppice system might be beneficial to the widely spaced timber trees, especially during very dry and hot weather conditions that are forecast to increase in the future. Conversely, the shady environment provided by the mature trees for the SRC component may help the SRC cope with very high evaporative demands. However, the SRC component might also cause an increased water deficit in the soil, and woody coppice is known to be more water-demanding than annual crops (Petzold et al. 2009). Potential benefits could thus be negated by the effects of competition for water. Predicting the final outcome between these positive and negative effects is a challenge that needs to be addressed using both field experiments and computer modelling. Processes such as plant root plasticity, three dimensional compensation strategies of plants, micro-climate modifications and phenology as influenced by shade and organ temperature may also modify the functioning of the associated plants in alley coppice systems. In this review, we have introduced and summarised the current knowledge from existing systems in forestry, SRC and agroforestry that may be applicable to alley coppice systems. The implementation of alley coppice on suitable land appears to hold some advantages compared to traditional land use concepts such as pure SRC plantations or agroforestry. Furthermore, it could provide additional biomass for both the energy and the material wood industry, contribute to the diversification of farmers’ product lines, and increase biodiversity, soil quality, and ecosystem services. However, potential disadvantages may be the increased water demand of alley coppice systems, the danger of devaluing sunburn on the stems of the high-value timber trees and the long management cycles that might dissuade farmers from establishing alley coppice systems on their fields. At present, only a few alley coppice systems are in existence, and knowledge on their management, productivity and biological aspects are poorly understood. In particular, the interaction between high-value timber trees and SRC has undergone little research. Given the many positive effects that can be expected from establishing alley coppice systems, we recommend future research should be undertaken to identify potentially problematic aspects, and to develop optimised designs and management strategies to cope with them. The European research project AGROCOP is funded by a joint WOODWISDOM and ERANET programme including the following national funding organisations: the Federal Ministry of Education and Research (BMBF; Germany), Project Management Jülich (PtJ), Ministère de l‘Agriculture, de l‘Ali-mentation de la Peche, de la Ruralité, et de l‘Aménagement du Territoire (MAAPRAT; France), Ministry of Agricultural, Food and Forestry Policies (MIPAAF; Italy) and Department of Agriculture, Fisheries and Food (Ireland).